EYESHINE An exhibition of images and video works that specifically exploit the technological properties for visual enhancement . The subject of the works are beauty spots where major industrial complexes are located. 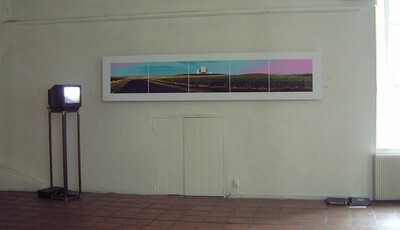 Presented as sites of wonder and awe, the images address our ( the viewers) desire for beauty, for visual gratification. They reference a photographic history of landscape documentation and the desire for the “ideal” in both composition and subject. However in these works, to reach that point of satisfaction, the viewer must first overwhelm their knowledge of the place. The rural “ideal” becomes the ideal place to contain the industrial sites that are both the product and the producers of that desire. Video works explore these locations through time and space. GENERAL STATEMENT I explore the relationship between technology and image making.This involves moving image (video) and still images using lens based equipment and computer enhancement. Some work looks inward to the nature and process of the technology itself, this work is ”non-narrative‘ but utilises, light, colour, movement and signal. Other bodies of works employ these aspects to look outward at ‘”reality” . I have a particular interest in landscape, that is the cultural visual representations of land. I have also undertaken a number of collaborative and site specific projects (including public art and theatre) using various technologies including sound. My interest in technology began with an exploration of the fundamental qualities it offered. Light, colour, movement, interval and time have been the sole basis of many of my works always without external subject matter. More recently this has extended into the use of feedback loops and crossing of output and input signals. Still images have always been an important aspect of these projects. Living in rural Perthshire and travelling to a studio in Glasgow to make work, I found myself commuting daily between two worlds which seemed to have no real knowledge of each other. This split in life and in art became a challenge for me to try and resolve in my own work. It took three visits to Australia and New Zealand where landscape art is a vibrant genre, to provoke my current projects which combine my interest in technology with the land as subject. 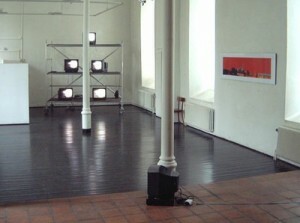 In “Scenario” which was exhibited in New Zealand , Lithuania and England and is documented in the book “Shifting Horizons”, I captured still images from video at the points where the technology itself collapsed – the cusp between analogue video and digital computer formats. The fractured frames, default colours and wild inserts caused by this collapsing state, created images which reflected on the uncertainties and instabilities existing within the land today . EYESHINE came about through visiting sites where industrial complexes exist in areas of rural beauty. Here is the ultimate point of collision, where the rural ëidealí becomes the ideal place to contain the industrial sites that are both the product of and the producers for the necessities of modern life. These EYESHINE images are presented as sites of wonder and seductive beauty, they address our ( the viewers) desire for visual gratification.They reference a photographic history of landscape documentation and the desire for the “ideal” in both composition and subject. However in these works, to reach that point of satisfaction, the viewer must first overwhelm their knowledge of the place. The images are supported by various video works of the same sites. By being there in ëalmostí real time, but by using video techniques of panning, zooming, speed variability and lens flare, these videos create different ways of “seeing” the reality which is actually there.